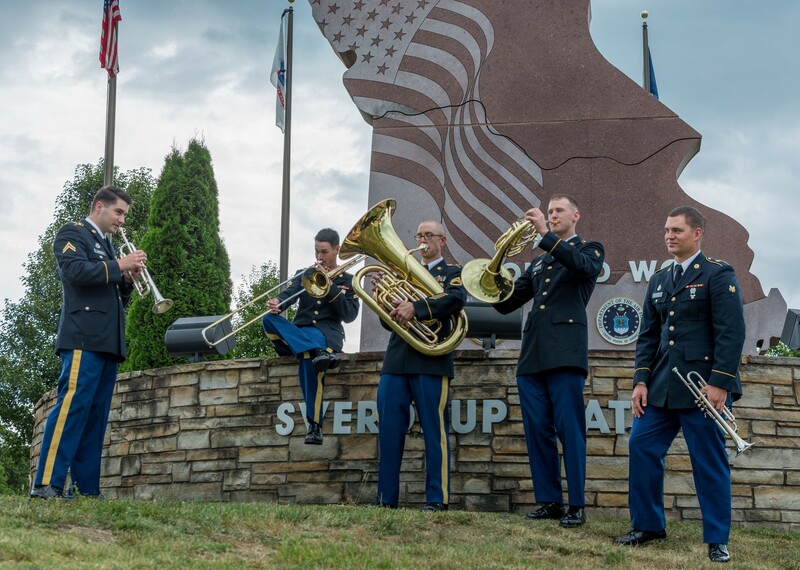 Fort Leonard Wood's own 399th Army Band Missouri Brass was voted not only winner of best Music Performance Team in the Small Instrumental category, but they also earned the overall title of 2017 Army Music Performance Team of the Year in a recent Army-wide competition. This is the second time in three years a Music Performance Team from the 399th has won the competition, which began in 2012 and is voted upon strictly by peers. According to Sgt. Daniel Arnold, Missouri Brass trumpet player, the competition consists of several types of performance teams, including rock bands, woodwind quintets and jazz combos. "The whole point of it is to inspire other organizations within the Army Band, give new ideas and to give people new goals," Arnold said. "It's like 'oh OK, you can put on a quality product for the public, but can you put on a quality product for your biggest critic, your peers?'" Each performance team wishing to compete is required to submit a five-minute maximum length video of a live performance. The video was required to be unedited, start to finish. "Our commander's responsibility is quality within our organization; however, he delegates a lot of that authority down to NCOs and team leaders. Our team leader at the time, Staff Sgt. Dan Aston, had a vision for us to raise our public outreach and a byproduct of that was a fantastic recording that we could submit," Arnold said. "The commander gave us the go-ahead, it was just a series of fortunate events." Spc. Evan Wendholt, Missouri Brass trumpet player, said the selection chosen for the outreach recitals and ultimately for submission was "Escape" by composer Kevin McKee, a tune he remembers playing in college. "I brought it in, we all liked it and went from there," Wendholt said. "It's definitely one of our more difficult pieces." Arnold said he believes the difficulty of the "more modern piece" helped with the competition's outcome, an outcome neither of the Soldiers were expecting. "We didn't win by a small margin, we won with about 250 votes, the second best was 169 votes. So even if our entire band had not voted for us we still would have won," Arnold said. "It was jaw-dropping to us because we perceived ourselves as the underdogs being from a smaller band. There are larger bands that have 60 to 70 people and we've got not even 40." Wendholt added, "I can only speak for myself, but I was kind of like 'yeah we have a good chance' but wasn't saying it was going to be a knock-it-out-of-the-park kind of scenario, so when they announced the category winners I was excited. When they came out and said we had the won the whole competition throughout the Army Band, that is outstanding, that's awesome."